Top 100 Independent Travel Websites List. The list is made up of the most amazing travel websites from across the world. Websites by people who are on the road blogging as they go, and those who have hung up their boots to now share their wealth of knowledge to enrich your travelling experience. At the end of each month I enter a Journey Jottings highlight on a Map Journal so at year’s end I’ll have 2010 simply summarized on a single sheet ~ The image above is September’s entry. Have you jotted your September highlight down somewhere? 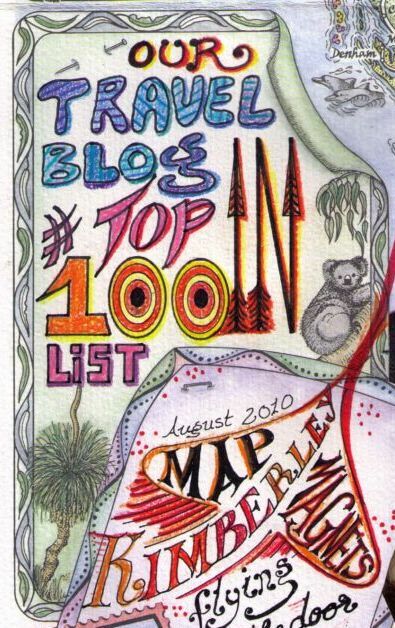 This entry was posted in Our Year at a Glance and tagged 2010, map_journal, year_at_a_glance by Linda. Bookmark the permalink. That is so awesome, Linda! Congratulations. We are setting up an awesome Outback Travel site and would love to promote Journey Jottings! In fact, I would love to promote JJ on my book blog! Hi Linda! Of course my September highlight was another visit to the fabulous Innes National Park in South Australia! Thanx for visiting this post on my blog, and for your kind comment! Congrats also on being included on such a prestigious list!! Your post about the Innes National Park was a new one to me ~ Such a beautiful spot, and as you say a part of South Australia that is so often inexplicably bypassed! Congratulations on making the top 100! Those are the kind of achievements us bloggers aspire to accomplish. Are you a travel lover as well as a lover of grey matter? WOW… I love that image!!! You should maybe be creating the new banner for the TOP100… I’m doing the math as we speak and it looks like you’ll be in the fight to be on the list again!!! Congratulations, Linda. This is an excellent achievement. My September highlight was signing enough ‘big corporation’ consulting business to cover all costs for the next 18 months. It’s just wonderful the way long-term business works – something I never take for granted. WOW Robin ~ That sounds like some ‘highlight’!